Dale Zentner makes beautiful fashions sold on her website Pink Grapefruit. Her dolls, which she painted and styled herself, are lovely. Her photos are amazing. Check out Dale’s dolls, fashions, and photography HERE. 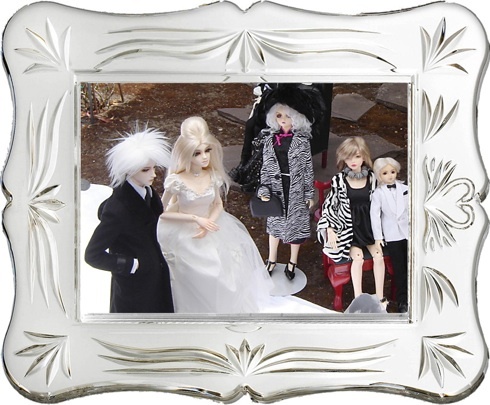 Cotin Doll World is starting their 6th Anniversary sale. All items in the store except designer items will be 20% off. Random items will be selected and sold at 50% off for 48 hour periods. A free robe for SD, MSD or Yo-SD size dolls will be sent for orders over $100. Special sale links are located at the top left of the site under the banner. The first 48 hour sale item is now posted. It is a shaggy burgundy boys wig. The Anniversary event runs unitl October 25, 2009. Check out the gorgeous ‘blended fashions’ by the talented Connie Lowe of Marbled Halls. Mio has posted new doll fashions and will be taking pre-orders until February 5th (Korean time). Orders over $200 will be shipped for free. For orders of less than $200 the shipping will be discounted 10%. Generally orders take between 1 to 3 months to fill. The maximum time can occasionally be 4 months. Featherfall has new Dollheart fashions available for pre-order until the 26th of December. Items ordered will be shipped in late february-march 2009. There will also be a Boxing day sale on the site on the 26th and MSD Crimson Fers will be available for order. Orders over $150 ship for free in Canada and the US until December 31st 2008.